Over the last 13 years of having children we have taken our children on countless vacations but it recently occurred to me that I have only taken my parents with us 3 or 4 times. We took them to Disney World and on some shorter weekend travel adventures. I have been so busy making memories with my own children that I forgot to make memories with my own parents. This year I plan to change that. They aren’t necessarily up for a cruise around the world or trekking through the trails in a foreign country, but there are plenty of things we can do with them that they will enjoy that my children will also enjoy. The options are endless depending on your budget and the health and mobility of your parents. Of course every grandparent wants to see the sparkle of Disney World in their grandchild’s eyes. I think it is safe to say that is on everyone’s (or at least everyone with small children) bucket list. 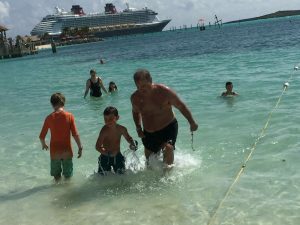 Cruising is a fantastic vacation for older adults that may not care to run through theme parks or up and down mountains. 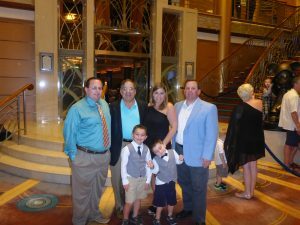 Cruising is the ideal multigenerational vacation because there is something for eve ryone. Most modern cruise ships have everything from nurseries and kid’s clubs with Wii and XBox to Bingo and movies. 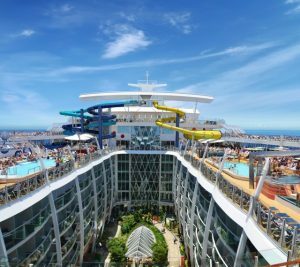 Many of the newest Royal Caribbean Cruise Line ships have zip lines, rock climbing, ice skating and water slides but they also have an area called Central Park where you can just relax and take in nature. There are beautiful sitting areas where you can just read a book or chat with a friend. There really is something for everyone! For most people there are even great weekend getaways that are in driving distance. Vacations do not always have to be grand events that costs thousands of dollars and last for days. Often, special memories are made in 2-3 days close to home. Anything under 5 or 6 hours may be manageable with an older adult. We are taking my parents to the beach for spring break this year. This will not be an extravagant adventure but it will be meaningful. We can sit and watch the waves crash together. They can eat at our children’s favorite restaurant. Most importantly we will all remember our time together. IMVoyager.com recently posted some great travel tips for traveling with someone that is older in age. Most of the tips were honestly common sense but they were great reminders of the things we often get busy and overlook. One was a simple as remembering to accommodate their medication. When we traveled to Disney World with them, I made sure we had a working refrigerator for my dad’s diabetic medicine. Not a big deal really, but I took the time to make sure he had what he needed. My favorite tip from the blog’s list was the last one. “Enjoy the time, it will get over soon.” To read the post, you can find it on IMVoyager’s blog.